Our Hotel has 28 rooms altogether . 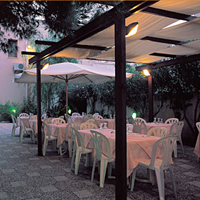 The 15 rooms called "Coral" are located in the Main Hotel in Via Garibaldi, while the 13 rooms named "Amber" are situated in the annexe in the nearby Via Albanese(two minutes walk !!). All the rooms have the same furnishings and offer the same facilities and services. Two of them are suitable to host disabled people.